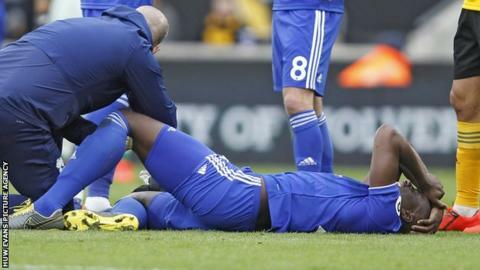 Cardiff City defender Sol Bamba has been ruled out for the rest of the season after damaging knee ligaments. Bamba, 34, was forced off the field on a stretcher during Cardiff's 2-0 Premier League defeat at Wolves on Saturday. Manager Neil Warnock confirmed the Ivory Coast international ruptured his cruciate knee ligament and now needs surgery. Bamba has started all bar one of Cardiff's top-flight games this season. His absence will be a significant blow for the Bluebirds, currently in the relegation places after three successive defeats. "Unfortunately our biggest fears have been confirmed regarding the injury Sol suffered at Wolves on Saturday," said Warnock. "Scans have shown that Sol has ruptured his ACL. He will have an operation on Wednesday and therefore miss the rest of the season. Bamba was ever-present as the side won promotion to the Premier League last season. He signed a three-year deal in August 2017. His injury also means he will miss June's Africa Cup of Nations for the Ivory Coast, who already have a fitness concern over Levante midfielder Cheick Doukoure. "It is with great sadness that I have to leave my team-mates for the rest of the season," said Bamba in a social media post. "Of course it is a big blow for me at the moment, but we have to think about the club first and focus on our goal to achieve, that is staying up. "It has always been my dream to play in the Premier League and this season I have been lucky enough to do so. "The team and the gaffer have my full support and I will be there behind them for the final nine games."